Building better bedtime routines for children. BACKGROUND: The brief was to design a digital solution that tackle sleep in a multi-user context. OVERVIEW: An immersive storytelling tool to support parents and children build a fun and consistent bedtime routine. TEAM: Bori Lee, Chirag Murthy, Hannah Rosenfeld & myself. MY ROLE: User research & synthesis, concept development & prototyping. RECOGNITION: First author for work-in-progress paper for TEI (Tangible, Embedded & Embodied Interactions) 2017 published by ACM Digital. We explored sleep in a variety of contexts–from remote families to new parents–and found ourselves particularly drawn to the opportunities to support families with young children in building healthy and consistent bedtime routines. Iyagi was born out of the need to ease the friction that comes with initiating the bedtime routine as well as moving between activities for both parents and children. It aims to do this through interactive, immersive storyscapes that unfold across rooms, incorporating elements of the bedtime routine along the way. Parents stressed the challenge in initiating the bedtime routine and moving children away from what they are doing. These transitions tend to be intense points of friction that can lead to a lot of nagging and yelling. Delays that take place before and during the routine have a cascading effect on the routine. Parents take this in their stride, but this was a pain point for most of them. 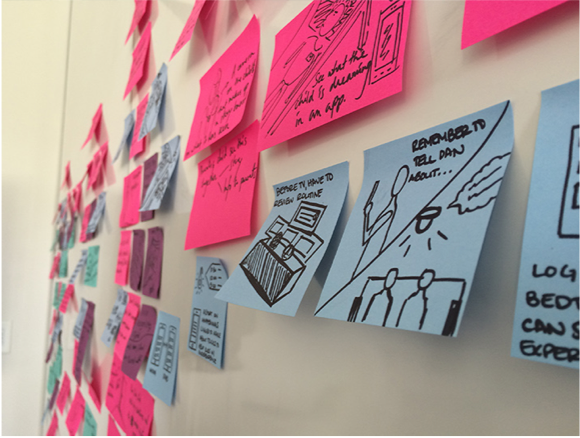 After brainstorming a range of ideas, we developed the following concepts into storyboards. 1. A digital art board that uses art as a calming transitional activity from playtime to the start of the bedtime routine; the board also serves as a fun visual indicator of time. 3. A ball that acts as a co-participant in the routine as it directs children from activity to activity. The latter was intentionally chosen to test some of our assumptions along with the limits of people’s comfort. allow everyday objects to be incorporated into the storytelling experience, allowing actions like brushing teeth to offer a novel means of engaging with the story. The app controls back-end functions like story selection. Smart lighting helps create a progressively calming environment as the family moves through the routine. A look at how Iyagi moves parents and children through spaces and activities. Voice interactions felt like the most natural way to interact with Iyagi given the storytelling context. We considered a range of scenarios of use to ensure the speech input options offered were intuitive and non-disruptive to the storytelling. Iyagi listens to the parent as they read the story to look for key words to move the story forward accordingly. Iyagi's immersive stories offer unique interactivity that engages children and enables bedtime activities to be incorporated into the story. For example, the movement from a toothbrush can help Jack climb up the beanstalk in the story. Iyagi’s mobile application can be used to control important back-end functions, such as setup, customizing bedtime routine, selecting story preferences and accessing bedtime reports. To help us think through interactions with the system, we created this projection prototype to help us walk through the experience of using and interacting with Iyagi. We tested the storytelling tool with Felix, a vibrant, energetic 6 year-old. He was captivated by the images from the moment we turned on the projections. It was interesting to see him narrate his own version of the story, rather than listening to ours. While Felix’s response was positive, this was a one off interaction with the system. For a more thorough evaluation of the Iyagi’s effectiveness, we will need to observe how parents and children use the system on an on-going basis as part of their daily lives. What would a service ecosystem around Iyagi look like? There are opportunities for partnerships with companies such as Amazon and Philips to deliver Iyagi's immersive storyscapes. For example, Amazon could sell "storyscape" versions of popular children's books alongside their physical and Kindle versions. Philips Hue's connected lighting system can be incorporated into Iyagi to dim lights in certain rooms after bedtime activities are completed to give the sense of the house heading to bed too.